Yoo Gil-jun's place of exile (Chui Oon-jeong) : Kahoi-dong No. 1-5 site. Yoo Gil-jun was confined to Chui Oon-jeong as a rebel for 7 years. During that time, he compiled the book called "Seoyu Gyeonmun (Western Knowledge) ," that introduced western culture into Korea. Chui Oon Jeong archery ground: Located around Kahoi Dong 1 site, this was the place where Son Byung-hee, Park Dong-jin, and Oh Sae-chang, independence leaders of the March 1 Independence Movement, practiced archery to cultivate their minds and bodies. Il Gajung site: Located at the lower part of Kahoi-dong No. 1 zone, this area became renowned as the 5 Cheosajeong of Seonchon which includes Seokhojeong of Jangchoongdan, Hwasoojeong of Mapo, Cheongryongjeong of Jagidong, and Seohojeong of Cheonyeondong. Hong Soolhae-gol: Kahoi Dong No. 250 site. Hong Sool-hae, governor of Hwanghae, was charged with theft and banished to an island. His son Sang-bum, who bore a grudge for his father's exile, was executed while plotting a rebellion. Thereafter, a pool replaced Hong Sool-hae's house, so the site is called Hong Sool-hae-gol and "Pond street." Wansoon-goong site: Kahoi-dong No. 91-171 site, this was the home of Wansoon Goon Lee Jae Wan, nephew of Hong Sun Dae Won Goon. Hyeon Sang-yoon house site: Kahoi-dong No. 1-192 site, this was the home of Hyeon Sang-yoon, a scholar born in the 30th year of King Kojong's reign and one of the Forty-Eight People's Representatives..
Neung Seong Wui Goong site: Kahoi-dong No. 177, 178 sites, this was the home of the King's son-in-law, where the daughter of King Yeongjo and Moon Sook Eui (rank of a royal concubine) was wedded to Neung Seo Wui Goo Min Hwa . Son Byung-hee house site: This is a commemorative site for the March 1 Movement. It was the home of Son Byung-hee, leader of the Cheondo religion in the period between the end of the Chosun dynasty and the founding of the Korean republic. Poong Yang Jo clan family site: Je Dong No. 83 Site (within the Constitutional Court of Korea) , this was the household of the Jo family for 7 generations and maiden home site of Queen Sinjeong Wang Hoo. Industrial Bank Administration Center site : Kahoi Dong No. 178 site is designated No. 14 in the Seoul Metropolitan Folk collection. Baek In-je family site: Kahoi Dong No. 93-1 site was designated No. 22 in the Seoul Metropolitan folk collection. It was built by Han Sang-ryong, the nephew of Lee Wang-ga, with Korean black pine from the Yalu River. It is in a good state of preservation. Kim Chang Neong Wuigoong Palace site: Jae Dong No. 5 site (Hankook Hospital site) , this was the place where Princess Bok On, the second daughter of King Soonjo, was wedded to the Chang Neong Wui Kim Byeong-joo . Lacebark (?) pine of Jae Dong: This is Natural monument No. 8 and Jae-dong No. 35 site, located within the Constitutional Court of Korea. Andongbyeolgoong Palace site: Anguk-dong No. 172 site, this was the site of the home of the royal family since the early period of Chosun Dynasty until it became the wedding ceremonial palace of King Sunjong, the last emperor. Yoon Bosun house site: Anguk-dong No. 8-1 site is also designated No. 27 in the Seoul Metropolitan folk collection. Jang Won-seo site: Hwa-dong No. 23 site was the site of the government office that controlled matters related to gardening of the palace. Bokjeong site: Hwa-dong No. 35 site was the former site of a well called Bokjeong (blessed water, well of good fortune) . It is said to have been used by the royal court during the Chosun dynasty. Hwagidogam site: Hwa-dong No. 1 was the former site of a temporary government office established for the manufacture of firearms under the Ministry of War. In 1614 (the 6th year of King Gwang Hae Goon) during the Imjinwaeran, or Seven-Year War, the Matchlock Office was formed in order to develop firearms to counter the Japanese soldiers' matchlock rifles. When the Ching Dynasty gained power, this place was reformed for the production of firearms. Seong Sam-moon house site: Hwa-dong No. 1 site, Seong Sam Moon was one of the Sayooksin (six faithful retainers who died for King Danjong) . Jeongsin Girls' High School: Presently the site of Poonmoong Girls' high school, this was a private girls' school founded by Annie Ellers, a presbyterian missionary from North America, in the 14th year of King Kojong's reign (1887) . Maria Kim, a revolutionary of the Independence movement, worked as a schoolmaster here. Sogyeokseo, Chot-inboo, Gyujanggak, Saganwon: This is the site of the Defense Security Command. This site was occupied by the Japanese army's Capital Army Hospital in 1913. Then from March 1928 until liberation, it was occupied by the Confucian Medical School's affiliated clinic. After Liberation, it was used as Seoul National University Medical College's second affiliated hospital. Saganwon site: This is Sagan-dong No. 65 site, this was the site of the government office that criticized and refuted the misdeeds of the monarch during the Chosun era. Gyujanggak site: This is Sogyeokseo No. 165 site, originally built in 1776 in the site of the royal palace when King Jeongjo ascended the throne. This was a repository and library of historical records for succeeding monarch. Sogyeokseo site: During the Joseon era, this shrine was an important place for the preservation of Taoism and the practice of Taoist ceremonies. Beonsachang site: Now located in the northwest vicinity of the Financial Inservice Training Institute, this site was designated by the Seoul Metropolitan Government as Tangible Cultural Property No. 51 in 1982. This was the site of a munitions warehouse that was part of the Ordinance Bureau established in the early part of the Chosun era. It was called as an explosive warehouse site. The forms and classifications of land in the 1912 Land Registration Map shows the plots of land in districts near the royal palace such as Anguk-dong, Jae-dong, Hwa-dong, Wons대-dong, and Palpan-dong and southern districts near Yulgok street are crowded together in irregular street networks. The streets of Kahoi-dong and Gye-dong follow the waterways. The land lots along the streets are separated into small lots, whereas larger land lots can be found near the ridgelines farther away from the streets. The 1912 Land Registration Map categorizes these land lots as hanok residential sites, excluding the northern region close to the mountain where residential sites were not yet formed. The small land lots had low foundations and were located next to the street in the lower regions. These presumably belonged to commoners and lower-middle class people. The larger lots had higher foundations and were located further away from the street in higher regions. These presumably belonged to men of influence. The 1921 map of the capital city shows this states of affairs and marks Hansangryongjeo (Baek-injega) , now Kahoi-dong No. 93 zone east of Jeongdok Public Library, and Mindesikjeo, (now a hanok cluster of Kahoi-dong No. 31 zone) . A list of landowners from the 1917 Detailed Land Statement of Gyeongsungbu (Seoul during the Japanese occupation) shows that Kahoi-dong No. 16 and No. 17 zones west of Kahoi-dong Street had become Leejaewhanjeo and Kahoi-dong No. 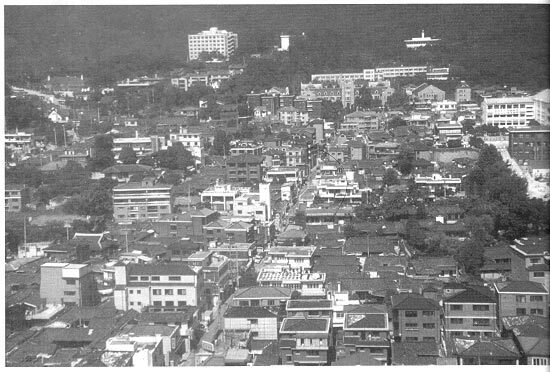 26 zone east of Kahoi-dong Street had become Hanchangsujeo (now a hanok cluster in the area of Kahoi-dong No. 11 zone) . Then beginning in the latter half of the 1920, the large land lots and sites classified as fields and woodlands, which until then had not been divided into land lots, underwent major changes. Kahoi-dong No. 31 zone which measured over 5000 pyeong was divided into a land lots measuring approximately 50-80 pyeong in the 1930s. Kahoi-dong No. 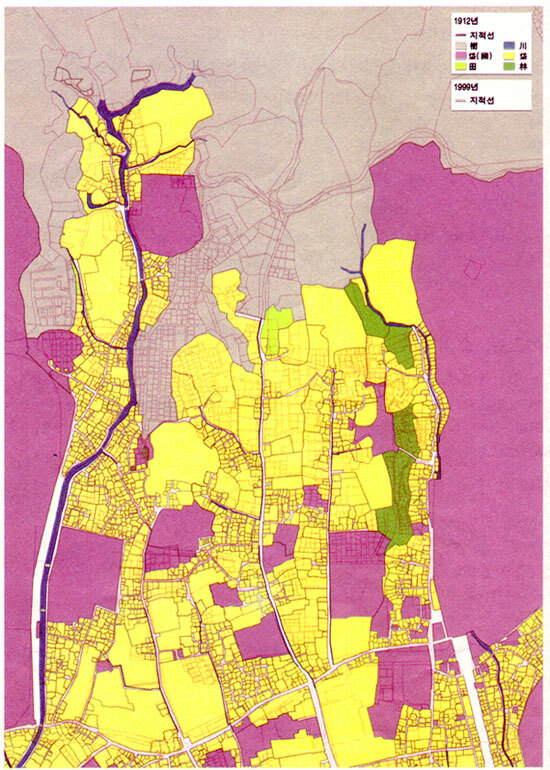 26 zone which measured over 2700 pyeong was also divided into small and medium size land lots measuring approximately 50 pyeong during construction in 1935. Areas once marked as fields and forests in the 1912 Land Registration Map, hill areas marked on the 1921 map of the capital city, and what is now the whole area of Samchung-dong No. 35 zone, Kahoi-dong No. 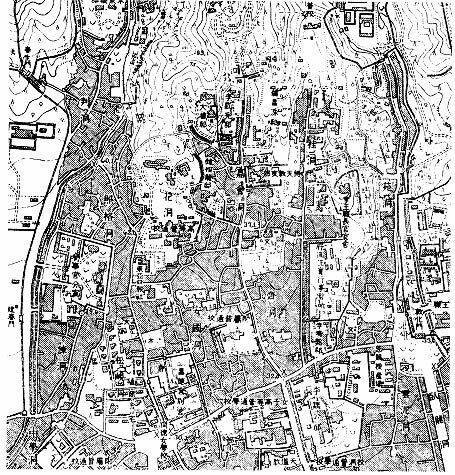 1 zone (1931) and the whole area of Gye-dong No. 2 zone were converted and organized into small and medium size land lots. 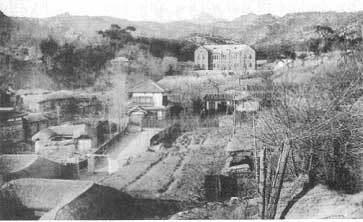 Residential hanoks were built on a large scale by housing management companies such as Jeong Se-gweon (a Geonyang company, 1919-1942) and Gim Jo-ryang (Gyeongseong lumber company, 1932-1937) . When compared to previous hanoks, these so-called "improved hanoks" and "commercial hanoks" had disadvantages. Firstly, new materials such as glass, galvanized iron, and tiles were used and surfaces were simplified and standardized. Secondly, large-scale construction would be carried out on lands that would then be parceled into lots. Thirdly, as residential sites and hanoks were built at the same time, the traditional hanoks encountered the modern city and developed into urban residences, or even "urban hanoks." These urban hanok residences were built steadily after Liberation until the beginning of the 1960s. 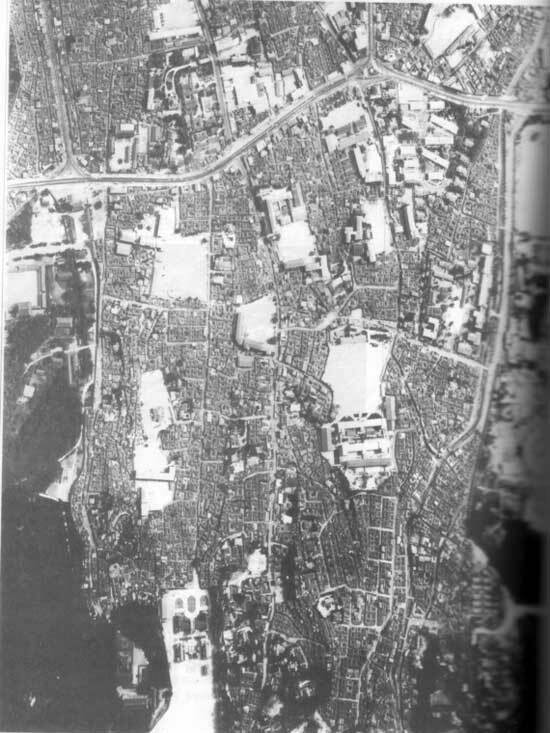 An aerial photograph of Bukchon in 1962 shows the large land lots and former hill areas filled with hanoks, in continuing from the hanok residences of the Chosun period.